A power play about power plays, Jean Anouilh's now-classic Becket provided the basis for one of the great screen pairings. 148 min. Paramount Pictures. Director: Peter Glenville. Cast: Richard Burton, Peter O'Toole, John Gielgud, Donald Wolfit, Martita Hunt. A power play about power plays, Jean Anouilh's now-classic Becket provided the basis for one of the great screen pairings. Drinking buddies Richard Burton and Peter O'Toole play drinking buddies Thomas à Becket and King Henry II in Peter Glenville's screen adaptation of his celebrated stage production. Throw in John Gielgud as the silky, sly King Louis VII of France, and you get an irresistible costume drama—the sort they don't make like they used to. Becket makes for compelling character drama, though imperfect history (Becket was not Saxon but Norman, a sticking point Anouilh realized only after his improvement on history was finished). In a highly controlled performance, Burton broods, while O'Toole effectively chews the scenery as the bombastic, conflicted king who cavalierly demands all power in the realm, decrying any check or balance. 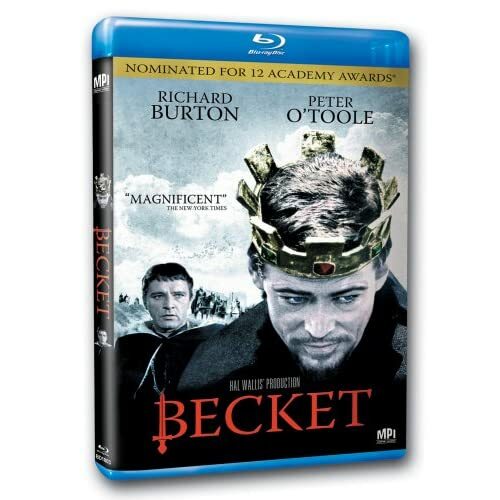 Burton plays right-hand-man Becket as the king's tragically perfect complement, defined by earnest, sincere integrity. Framed as Henry's graveside eulogy—a sort of emotional filbuster—the story quickly flashes back to establish the duo's male bonding (drinking and wenching). They share a "guy love" that's a matter of mutual respect and—at least from Henry's perspective—perhaps more (Empress Mathilda chides her son Henry: "You have an obsession about him that is unhealthy and unnatural!"). Though their relationship is conflicted, the two share an island of intelligence surrounded by a sea of fools. Divided loyalties result in personal slights, complicating Henry's relationship to the only person who has ever loved him. Politics pull at the fragile seams of their relationship. Understandably calling Becket the only man he can trust, Henry positions his friend as England's chancellor and, later, archbishop of Canterbury. The unambitious Becket seeks neither role, but—unwillingly saddled with responsibility—he refuses to take half-measures. A man of integrity and faith, he's doomed to clash with his Machiavellian "better" as church and state struggle for due and undue sway. Glenville has the invaluable help of DP Geoffrey Unsworth (2001, Superman) in transferring the talky material to a medium hungry for epic widescreen visuals. And oh, the talk! In a typical moment, Henry brays of Becket, "He's read books, you know, it's amazing. He's drunk and wenched his way through London but he's thinking all the time--he'll checkmate the lot of you!" Edward Anhalt collected the film's only Oscar, for the adapted screenplay. Dialogue peppered with political aphorisms (Becket: "A good occupational force must never crush. It must corrupt") and witty epigrams (Henry: "That's the Great Seal of England. Don't lose it; without the seal, there's no more England, and we'll all have to pack up and go back to Normandy") guides the tale of God and country and personal loyalty put to the test to its ultimately existential foregone conclusion. The jewel in the crown of 2007 DVDs—now on Blu-ray—was MPI Home Video's release of Becket, the long-out-of-circulation drama that scored 12 Oscar nominations. After forty essentially absent years, the film returns, restored with the support of the Film Foundation and the Academy of Motion Picture Arts and Sciences and presented in a robust hi-def transfer. Blu-ray provides a significant upgrade to the already handsome DVD. Since the hi-def master is the same, the same flaws are evident (in a couple of scenes, the color doesn't hold consistently—obviously an unavoidable deficiency of the source print—and the image can be a bit soft or flickery at times)—but many sequences are revelatory in detail, and there's no hint of digital noise. On the whole, the disc is what Becket himself might call a godsend. That sentiment extends to the terrific bonus features, beginning with the zesty commentary with Peter O'Toole in conversation with English film critic Mark Kermode. O'Toole discusses his process of "private study," working under his mentor Sir Donald Wolfit (and how Burton worked under his, Sir John Gielgud), and even his personal faith. Beside a couple of great Gielgud stories, O'Toole also peppers his comments with artistic philosophies, such as that great art is always "in the present tense" and that acting is "the art of the moment." Intriguingly, Kermode more than once attempts to describe O'Toole's inaudibly emotional reaction to watching the film. "Lawrence Rosenthal on his score for 'Becket'" (12:23, SD) finds Rosenthal—a youthful 80—describing his aural "vision" for the film and telling tales out of school about producer Hal Wallis, while the short but sweet "Anne Coates: Epic Editor" (7:12, SD) allows the award-winning great to spin some marvelous stories. The disc also includes two archival interviews from the BBC vaults: "Richard Burton: Interviewed by Ludovic Kennedy (1977)" (12:23, SD) and "Richard Burton: Interviewed by Kenneth Tynan (1967)" (13:58). Stage critic Tynan's chat proves tonier (including a dramatic reading from "The Boy with a Cart"), while the tenacious Kennedy presses personal points redolent of today's tabloid TV. MPI rounds out the disc with a terribly fuzzy "Theatrical Trailer" (4:48, SD), a 27-second "TV Spot," and a Gallery of 47 stills, lobby cards, posters, and pressbook images. All in all, the Becket special edition is a must-own for any self-respecting film or theatre buff. All site content © 2000-2019 Peter Canavese. Page generated at 04/25/2019 08:44:31PM.